By Arin Arpinar and Austin Voigt. Paid search advertising is exactly like Game of Thrones. There is absolutely no difference whatsoever, they are the same thing. One minute, you’re sitting comfortably on the Iron Throne, at the top of the page – the next, you’re battling the Night King’s army of white walkers (sometimes also referred to as “competitors”). Winter is coming, and you need a weapon. You could use dragonglass, or Valyrian steel – but those things are kind of rare, TBH. However, you do have Augurian – and we happen to be experts on a little weapon called ‘competitive keyword bidding’. Competitor keyword bidding is a strategy we recommend for the majority of our paid media clients. Competitor keyword bidding done well increases brand visibility, attracts “at-risk” searchers, and leverages remarketing lists more effectively. However, competitive keyword bidding done poorly is expensive and terribly frustrating. We’ve seen CPCs skyrocket and CTRs plummet. Not to mention, drawn out bidding wars that aren’t good for anyone. Quit wasting spend on irrelevant competitor terms and start having confidence in your competitor keyword bidding strategy. Read our overview on the pros and cons of conquesting, as well as best-use cases to help you choose the right weapon for battle. What is competitor keyword bidding? Bidding on competitor keywords – or ‘conquesting’ – is a strategy in which you intentionally bid on search terms directly related to, or containing the brand of, a competitor. This strategy is often best used when the keywords being bid upon indicate searchers are in the ‘research’ or ‘at-risk’ phases – meaning they aren’t currently committed to a specific brand. For example, take Jon Snow’s side hustle: Direwolf Apparel. This business specializes in winter coats. Its biggest competitor, Joffrey Jackets, often appears at the top of the search results page for relevant terms in this industry. 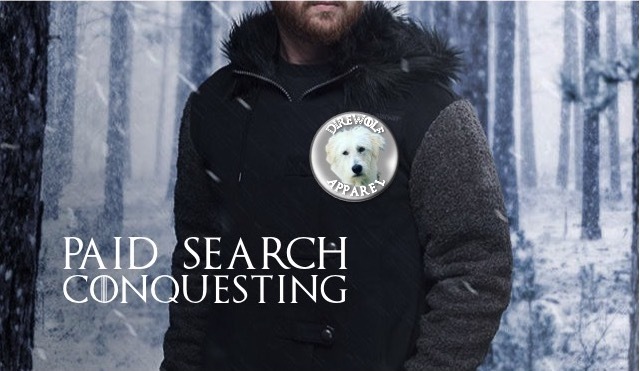 Direwolf Apparel’s paid search team is likely looking to bid on competitor keywords related to Joffrey Jackets, because they want to ride on its coattails (pun intended), and increase sales. Competitor keyword bidding can be a new source of capturing brand visibility and influencing consideration, with an audience that is generally very relevant. It can also ‘get back’ at competitors you really, really don’t like. Direwolf Apparel’s team knows most people would prefer their winter coats over Joffrey Jackets’, if they were only aware of them. Competitor keyword bidding can provide an alternative to brand switch at the right moment. Google docks your performance when you bid on competitor terms. This is because Google values their users’ search experiences within the platform. Therefore, Google wants the most relevant search results to appear at the top of the page (for example, a user searching Joffrey Jackets may be frustrated with Google’s performance when instead they’re served a Direwolf Apparel ad). Because of this docked performance, it is generally a very expensive tactic not just for the conquester, in terms of higher CPCs – but it will also then increase CPCs for the competitor on those terms as well. If Joffrey Jackets has the financial ability (which, let’s face it, they do), they will likely step up to the challenge and bite back at Direwolf Apparel to compete in auctions. It is often a controversial tactic, due to the fact that the conquested competitors can see what you are doing – which can often start bidding wars with those brands, increasing your own costs and decreasing brand visibility for your own campaigns. Leveraging remarketing lists for search ads (RLSA) can help you maintain your position in the prospect’s consideration, while you spend your money on more qualified clicks. For example, you can target users who have previously visited your site, but are now searching for your competitors. This can also provide you with insight on the users’ interests and intentions, via the search terms report. This strategy may boost ad relevance and click-through rates as well, yielding more efficient results and saving you some money. Targeting “at-risk” searchers, who may be considering other options besides the brand they’re searching for. For example “joffrey jackets sign in” is a search that’s indicative of a user who is committed to that brand, and likely won’t yield strong conquesting results. However, “joffrey jackets alternatives” is a search that is clearly indicating the user is looking for other options related to that brand. Competitor keyword bidding is a strategy that comes up often when considering new paid media tests and tactics. It’s easy to jump into – and spend a lot of money on – inefficient terms in this arena, without considering the best tactics to implement. Armed with the right information, however, it can be a valuable tool for any brand. And, let’s face it – winter is already here. No direwolves were harmed in the making of this blog.